Leinster are still the standard-bearers but Munster fired a mighty shot across the bows. It says a lot about the Leinster spirit, and collective talent, that they were still within winning distance with eight minutes to go. 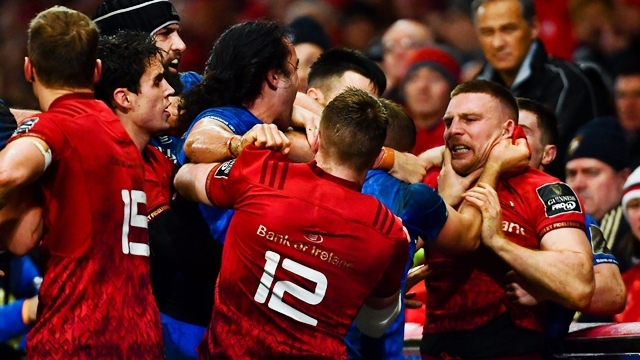 They played 50 minutes with 14 men and were down to 13 at one stage in a rabid, raucous Thomond Park.  That they got as close as 16-10 and had their hosts under the pump, inside their own 22, is a credit to them. 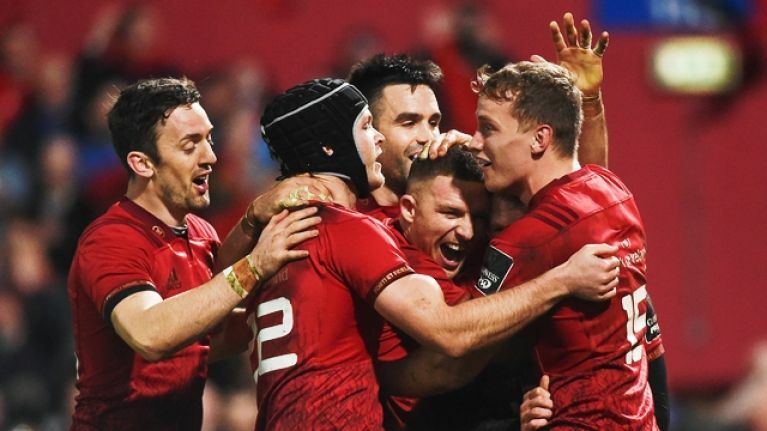 Munster held firm after dishing out the early punishment and Keith Earls sealed the win with a great defensive read on a flattish Ciaran Frawley pass to Jordan Larmour. Leinster had won eight of the last nine meetings between the sides and they sent an extremely strong XV to Limerick. Their bench was light on experience but they sent youngsters to Thomond Park last season and matchwinners like Larmour, James Ryan and Dan Leavy made their mark. "I thought it was a very tough game of rugby. Two of Ireland's provinces going at each other for 80 minutes. Firstly, very happy with the win. Also, want to give credit to the opponents. Thought they fought to the last play of the game. "I thought we kept our cool for the third week in a row. I thought our discipline was excellent and at crucial times we used opportunities and very happy with the win." Munster prop Dave Kilcoyne sat beside van Graan and looked a satisfied man. Acting captain CJ Stander could not make the briefing as he was getting running repairs in the dressing room (nothing too serious, just a dinged up ear). "Going back through the years obviously, it's a massive rivalry. I think Leinster have shown to be the standard bearer in Europe, in World Rugby... double champions. "Johann mentioned during the week that you can't contain a team like Leinster, you need to go after them and you need to win the game and I think that's what we did tonight. We didn't go out to try to contain them, we went out to win the game and fortunately, we were on the right side of that call." Asked if the squad was excited, more so than fretful, when Leinster named a strong team to travel down, Kilcoyne replied, "Massively. "You want these games, a sold-out Thomond Park. It's a huge game in our calendar year, same for Leinster. Everyone in Irish rugby knows it's a massive rivalry. It was a huge game for us tonight and I'm delighted to get the right side of the win." Kilcoyne and Munster will enjoy the result tonight, and tomorrow too. On Monday, Connacht come into focus.